We believe that climate change is a real and growing concern facing our planet today. And we’re ready to be part of the solution. We’re committed to reducing our carbon footprint through forward-thinking energy reductions and efficiencies combined with cost-effective carbon offsets. That’s why we’ve partnered with Carbonfund — supporters of third-party validated renewable energy, energy efficiency, and reforestation projects around the globe. Our climate troubles began as a result of the Industrial Revolution. Since then, carbon dioxide emissions in our atmosphere have continued to increase — primarily from the burning of fossil fuels like coal, oil, and gas. This, in turn, is having a dramatic impact on our climate, by warming and altering our weather patterns, melting glaciers, releasing stored methane deep from within permafrost, and rising sea levels. This is solid science and a looming environmental catastrophe. Although the far-reaching impacts of climate change sound daunting, just a 2% decrease in emissions per year could make a real and lasting impact. This is why Carbonfund’s work to help businesses and individuals develop practical and cost-effective solutions to reduce their impact is essential. Carbonfund is a nonprofit organization dedicated to helping businesses and people reduce and offset their carbon footprint. Their mission is three-fold: reduce what you can; offset what you can’t; educate the world that we are all responsible for climate change. Did you know the average American is responsible for about 50,000 pounds of Carbon Dioxide per year? Everyone has a responsibility to reduce their individual carbon footprint, and there are lots of ways to do so. Part of this you can do through how you live your life and having consideration for the environment in the choices you make. 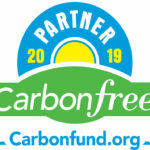 For the rest of it consider supporting Carbonfund’s carbon offset projects. As a company, we voluntarily offset emissions for our factory as well as shipments to you, the consumer, on an annual basis. We use Carbonfund’s business calculator to determine our offset requirements each year. We then invest that amount in projects that fund conservation projects, such as reforestation and forest preservation. Forest-based carbon offset projects fight climate change by sequestering carbon dioxide emissions from the atmosphere in trees and soil and have many co-benefits for the community and local wildlife. Forest preservation creates jobs, maintains and expands wildlife habitats, protects biodiversity and improves local environmental quality. As an activist company, focused on sustainability and social responsibility, we are always conscious of our impact, to reduce, offset, improve and even analyze the full lifecycle impact of our products. We’re not perfect, but we want to help lead the way. As an individual, we invite you to join us. Visit the Carbonfund website and calculate your carbon footprint and consider making an individual donation. Your actions speak volumes and small lifestyle changes can also have a huge impact. Looking for ideas on how to do so? Subscribe to our online magazine for weekly tips. You can also get involved locally within your community, and encourage your business to undertake similar initiatives. WE’RE STILL IN. ARE YOU? We believe in science. 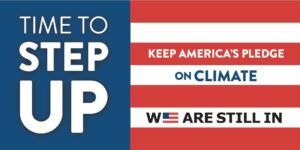 So we’ve joined nearly 3,000 mayors, county executives, governors, tribal leaders, college and university leaders, businesses, faith groups, and investors to show that we stand by the Paris Climate Agreement and are committed to meetings its urgent goals. Join us!